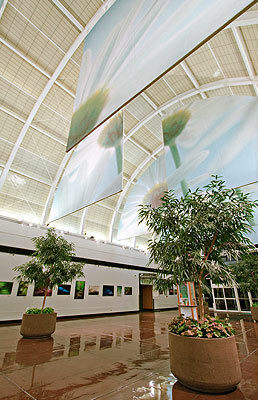 Monsanto Hall is located in Ridgway Center, the visitor’s center and entrance to the Garden. Enjoy breathtaking views of the Garden from this magnificent room. With its barrel-vaulted ceiling and rotating art exhibits, this spacious Monsanto Hall is an excellent choice for larger functions. The adjacent Spoehrer Plaza with its towering fountain centerpiece is also available in conjunction with the rental of Monsanto Hall.